There is so much history in Berlin that looking at only what is there now is incredibly difficult. I’ve been to few places where the history and impact of different ages is so apparent. The biggest recent change has been the removal of the Berlin Wall which harshly and absolutely divided the city. Much of the construction work to re-unite the city is now complete and has been very successful in removing all trace of the wall. In some places brass plaques has been added that run along the ground marking its previous route, but in most places you can’t tell anything was there at all. I couldn’t stop myself from trying to find out where the wall ran and as I walked around, imagining the city divided and how strange and hard it must have been for all those people living either side of it. Finding a map which had the line of the old wall marked while I was there was difficult, so I resorted to looking at some old maps my parents own over the Christmas break. Having not been to Berlin before I’d never appreciated that what was East Berlin included most of the old centre of Berlin. The Brandenburg Gate, just beyond the wall in the former East, was built as one of the most westerly of the 18 gates in the old customs wall from the 1730s (black border). Of the older Berlin Fortress (crenulated black line) there is almost no sign apart from the erratic wiggles of some streets. After the customs wall was completed the ramparts of the fortress were demolished, which were already in a poor state of repair at that point. The customs wall itself was removed in 1860 as Berlin expanded into the surrounding suburbs. On the first map, from a 1957 school atlas, you can see how close the Russian sector boundary runs to the old customs wall. When that map was drawn the wall had not yet been built and it is therefore only showing the divisions between the sectors of the four occupying powers. The second map from the same atlas shows the division of Berlin’s sectors and the outer solid red line based on the 1920 city boundary which was also used by the occupying powers to demark the city limit and acted as the border to East Germany. While these are nice maps, and the whole school atlas is a beautiful book, seeing the different types of red lines is difficult and at this point the wall doesn’t exist, so its eventual absolute divisiveness is not so apparent on the map. In the collection of maps on my parents’ shelves the easiest to see was a 1980 city plan. On paper I think the most obvious sign of how harsh a division it was is looking at the lines of the severed transport network. 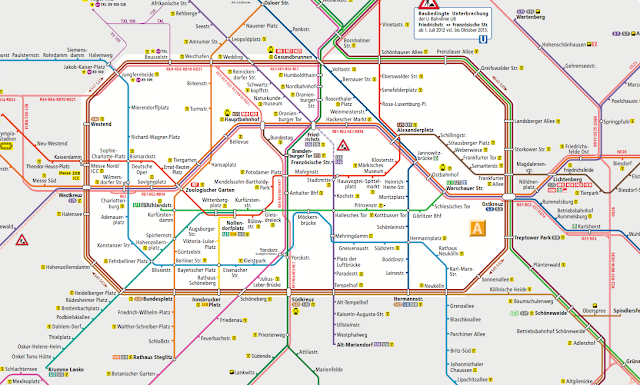 When comparing the 1980 and 2011 network map, it reduced many major interchanges to simple stops and made ghost stations out of others like Potsdammer Platz, which aren’t shown on the 1980 map but are now active again. The difficulty in spotting where the wall once was underlines how great an impact the wall had on dividing the city, its people and lives. The natural flow of the city with it gone really emphasises how artificial a barrier it was, built on shaky political pretence to cover up a failing system. To really see how oppressive the former GDR was I’d recommend visiting the Stasi Museum, which records the history of the East German secret police. Currently it is being renovated, so there is currently only a smaller temporary exhibition open, but even that is very powerful. The scale of the number of operatives and informants needed to keep the oppressive regime in power is staggering. Just before the fall of the wall it is estimated that around one in every 63 people living in East Germany collaborated with the Stasi. Officially this cost was around 1.3% of the East German state budget, but was probably much more. When the state is in such fear of the people it’s meant to be serving and supporting then there is something disastrously wrong. One of the creepiest aspects of the Stasi was that it was mostly just a large bureaucracy with an organisational chart that would look familiar to anyone who has ever worked at a large company. As individuals only had responsibility for a tiny part of the operation they didn’t feel connected or, crucially, morally responsible for many of the horrific things that the Stasi ended up doing. Berlin is a beautiful place with many great things to see both historic and modern but the biggest fascination for me is the most recent history. Being able to remember vague details of the fall of the wall when it happen from when I was very young it’s satisfying to now be able to put that in context and understand the importance of those events. The first two map images come from the 103rd (1957) edition of the Diercke Weltatlas. Copyright Westerman Verlag. A long running series of world atlases used in German schools. Started by educator and cartographer Carl Diercke in 1883 these school atlases have been used by generations of children and 125 years later are still being produced. First second two maps are taken from the 41st (1980) edition of the Falk city map of Berlin. Copyright Falk-Verlag. For those not familiar with the map brand Falk, they’re famous in the German speaking world for their Falkpläne which have a patented and cunning way of folding which allows you view any part of the map without having to open it completely. The map is the current public transport net map. Copyright 2011 Berliner Verkehrsbetriebe (BVG).